The following information will walk you through the basics of how to play racquetball. We created this page so that you could learn how to play the game as quickly as possible while providing links on certain topics for you to explore deeper. In short, the object of the game is to outscore your opponent while reaching an agreed upon score. Most competitions are played in a best-of-three format, known as a racquetball match, with games scored to 15 and a tie-breaker played to 11. See more on racquetball scoring rules. We have a diagram and explanation of the racquetball court lines below and another page on racquetball scoring. When racquetball is played with two people, playing in a one vs one match, it is referred to as a racquetball singles match. This is the most common way the game is played, both recreationally and competitively. Dive deeper into the rules, tips, and strategy of a racquetball singles game. When racquetball is played with four people, playing in a two vs two match, it is referred to as a racquetball doubles match. This gameplay is popular in both competitive tournament play and non-competitive recreation matches. Learn more about racquetball doubles rules. 3 player racquetball, also known as cutthroat racquetball, is commonly played in a 1 vs 1 vs 1 style, where the server attempts to score against the other two players playing as a team. This game style is not a tournament play variation but can be a lot of fun when you have an odd number of people. Read more about racquetball cutthroat rules. Below you will find a brief overview of the racquetball court lines. These are by no means an exhaustive set of the rules, but should be enough to get you up and running in a racquetball singles or doubles match. Check out our detailed racquetball rules if something is not covered here. Service Line - This is the line that is closest to the front wall. The line plays an important role in the serve. The person serving must have both feet on or behind the line. If one or both feet cross over the service line, this is called a foot fault, and the serve is lost. Short Line - This line divides the court in two. The short line plays three important roles. 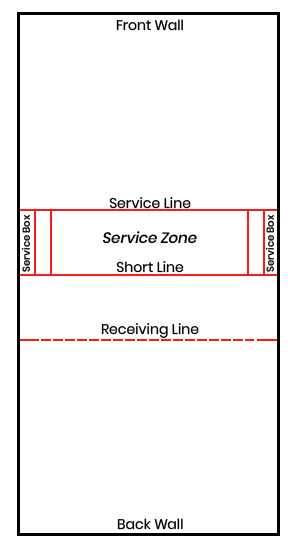 Service Zone - The service zone, or service box, is the area between the service line and the short line. This area extends all the way to the side walls with two sets of perpendicular lines along the edges. This is the area that the server has to serve within and stay within until the ball passes the short line. Service Boxes - This area is the box on either side formed closest to the wall in the service zone and is used in a doubles racquetball match. The teammate of the person serving the ball must stand inside one of these service boxes. We hope this page gives you a quick and easy overview of how to play racquetball. For more details on specific rules, gameplay variations, strategy, tips and tricks and more, check out the links below to dive deeper into the game of racquetball.